The importance of photonics in science and engineering is widely recognized and will continue to increase through the foreseeable future. In particular, applications in telecommunications, medicine, astronomy, industrial sensing, optical computing and signal processing continue to become more diverse. 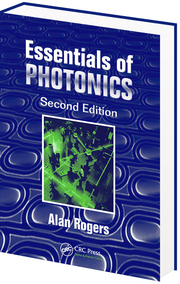 Written by an author with many years of experience in teaching and research, this book includes a detailed treatment of lasers, waveguides (including optical fibres), modulators, detectors, non-linear optics and optical signal processing. This new edition is brought up-to-date with additional sections on photonic crystal fibres, distributed optical-fibre sensing, and the latest developments in optical-fibre communications.